An exhibition of paintings, installation, and mixed media work by Iranian-born artist Shahram Karimi will be on view at LTMH Gallery from May 25 through June 18, 2011. The Rose Garden of Remembrance will mark Karimi’s first-ever solo exhibition in New York City, and follows his solo exhibition this winter at the Stadtmuseum in Siegburg, Germany. A fully illustrated catalogue with essays by Dr. Layla S. Diba and Octavio Zaya will accompany the exhibition. Karimi paints on found fabrics and objects (suitcases, chairs, even doors and old pieces of furniture). Working with colors including blues, greens, reds, and pinks, Karimi creates dream-like landscapes of figures and scenes that are neither here nor there; they exist in a time and place that is in between the past and the present. The exhibition will also include a one-wall installation, Look, which comprises over 25 old photographs, which Karimi has acquired at various points in his life. He paints on and over these images, reinterpreting them, and exploring the meanings of cultural and personal identity. Also featured in the exhibition will be Dusk, a collaborative work that Karimi has done with video artist Shoja Azari. The two artists first created what they call “video paintings” in 2007. Dusk is their most recent example of their collaboration, and portrays a spectacular view of the downtown New York City skyline. The medium combines traditional painting with video, so that once the filmed moving image is projected onto the painted canvas, the scene comes alive, and becomes seemingly infused with a sense of poetry and life. In her catalogue essay Dr. Layla S. Diba writes, “Shahram Karimi’s work speaks both of exile and its dreams of the past, and of transnationalism and its concern with the present. As an exilic artist, he conjures memories of his childhood and family life in Shiraz. Yet as an artist and activist living between Germany and New!\ York, he frequently alludes to contemporary political events in Iran and beyond. One of his most moving works, Traces, memorializes 248 modern Iranian activists, artists, poets, and intellectuals—a virtual visual history of the intellectual and cultural life of the period. Shahram Karimi was born in 1957 in Iran, and grew up in Shiraz. He has worked as the production designer on many of Shirin Neshat’s films, most recently Women Without Men, which won the Silver Lion award at the Venice film Festival in 2009. 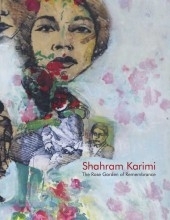 Karimi’s art has been widely exhibited in Iran, the United Arab Emirates, Turkey, Germany, Italy, and New York. He most recently had a solo exhibition at the Stadtmuseum in Siegburg, Germany.